Hello and welcome to my Checkatrade page, my name is George and I’m the owner of (Reassured) Reliable Assured Services. Founded in 2007, Reliable Assured Services has quickly established itself as one of the most efficient, trustworthy, reliable and dependable companies on which customers can rely on. With 10 years’ experience and a vast knowledge of Plumbing, Heating, Gas and Refrigeration principles, our aim is to always ensure our customers are satisfied. Reliable Assured Services - a company you can always depend on! 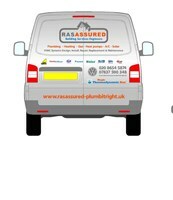 We offer 24 hour call out and are fully insured for your peace of mind. Call us today on 07837 590348 for a free quote!